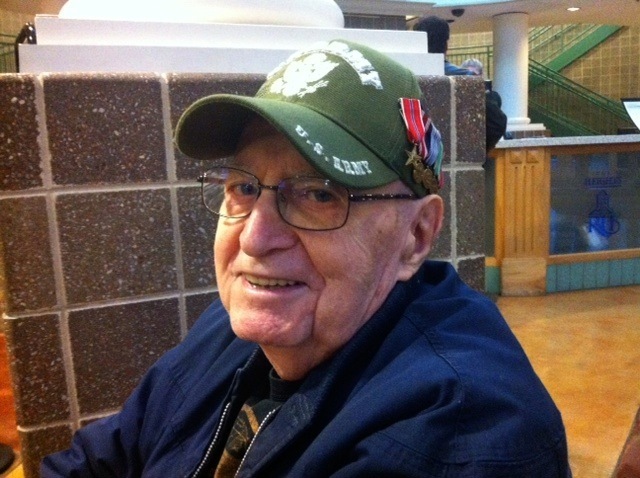 Once again, World War II veteran, Charlie Stefanoni, wears his Army cap with his medals on Veterans Day. He says he can’t remember what they’re all for. He was at The Heights for his workout Tuesday morning. Stefanoni is 89; he’ll be 90 next month. Thanks to Charlie and all our veterans. 2015 update: Originally published Veterans Day 2014 — missed 90-year-old Charlie at The Heights this year. Thanks to all the veterans out there! WWII veteran Charlie Stefanoni wears his Army cap on Veterans Day.